Whether you’ve blessed us as our Pastor for 50 days, 50 weeks, 50 months, or the entire 50 years of your faithful service – we are grateful. For fifty years you have labored at St. Matthews Baptist Church. You’ve shown what it means to open the Word to the world, and under your leadership, the church has both grown and stayed unified. You’ve officiated many a wedding and presided over many a funeral—always with the right words at the right time to focus our ultimate hope on Jesus. While the world has changed dramatically in the last 50 years, you have remained steadfast and faithful, tackling head-on the challenges that come with change, while at the same time embracing the opportunities change presents. You have stood behind the pulpit thousands of times, yet you have never used it as a platform for notoriety or personal gain. Through your powerful preaching of the Word, you have exposed us to a compelling combination of analysis and adoration by explaining to us what the text says and means while leading us to worship and praise His holy name. We will always remember the moments when your analysis tips over into adoration. We listen with anticipation as your voice moves up to a higher pitch, a quiver catches in your throat, and passion overpowers your voice until no one in the room has any doubt: This man feels the truth of which he speaks. “Some things we ought to know; some things we need to know,” you once preached from Romans 8:28. You went on to say “Many situations come up in life; stumbling blocks get in our way; and if it’s not one thing it’s another. But it’s good to know we serve a God who has promised to work all things out for good for all that love Him and are called according to his purpose.” That sermon, and so many others, remind us of the beauty of God’s providence – that He is accomplishing thousands of things in our lives all at once, even if we are only aware of one or two of them at a time. You, Pastor, are an example of the beauty which God places before us. For 50 years you have honored Him with conviction – conviction that overflows into exultation and leads to exhortation. With each passing day as we count down to your 50th anniversary and your retirement, we become more grateful for your love and support, your leadership, testimony and ministry. Know that your decades of spiritual leadership will live on at St. Matthews and in our hearts. You have made an indelible mark on the lives of all you’ve touched. And while our hearts ache at the thought of your retirement, our souls overflow with joy at the thought of all you’ve left us with through the example you have set for 50 years! Leave Pastor Washington an anniversary message at the Pastor's 50th Anniversary Blog. Good Friday service will be held at Second Baptist Church SW located at 5501 Silver Hill Road, District Heights, MD. Combined Choir and Combined Ushers will serve. If anyone needs transportation, please see Sis. Elthel Alexander no later than Wednesday. Pastor Washington requests a meeting with the Church. Easter Sunrise Service will be observed. Resurrection Sunday will be observed. Pastor Washington will be preaching. Revival will be held. Lectures will be begin at 7 pm. A light meal will be served at 5:30 pm - 6:30pm. If you would like to change your day to Fill-A-Pew, please see Sister Gwen Coleman. Thank you. Reverend Tyrone Martin will be our guest preacher. 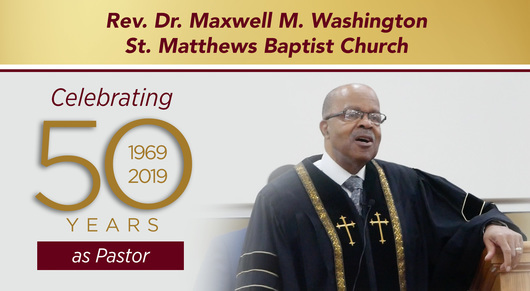 We will celebrate Pastor Washington's 50th Pastoral Anniversary and Retirement Banquet, at the Camelot by Martin's. Ticket Cost: $75.00. To make your reservation or payment, please see Sis. Alma "PNut" Hughes or Sis. Dawn Williams. Remember Those on our Special Prayer List . . .
As you go about your activities throughout the week, please keep those listed on the "sick/shut-in" and "special prayer" lists in your thoughts and lift them in prayer. A listing can be found in the Member Area. The Choirs and Ushers Ministries are seeking new members. Your dedicated service is greatly needed and appreciated. Please see any member for further information.